DCI World Championships in August. More than 20 corps from several countries will compete this Saturday, Sept. 24, when the Drum Corps Europe Championships return to Kerkrade, The Netherlands. The all-day event will kick off at 10 a.m. local time at Parkstad Limburg Stadium. The Premier Class Prelims competition will be followed by the Junior Class Finals and wrap up with the Premier Class Finals beginning in the evening. After winning the Drum Corps United Kingdom title last Saturday, the Kidsgrove Scouts will be looking to defend its 2010 DCE Championship title against a tough field of competition. 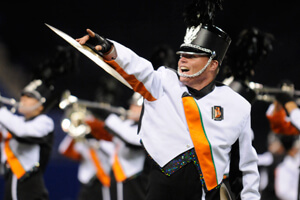 One of those challengers will no doubt be Jubal, who North American drum corps fans will remember from this past summer when the Dutch corps traveled to the United States to take part in the annual Drum Corps International Tour and World Championships. If you'd like to follow the action in Kerkrade, Drum Corps Europe will provide a live webcast of Saturday's performances free of charge beginning at 4 a.m. EDT (10 a.m. local time). "We want as many people as possible to see what happens here in Europe when it comes to drum corps," said DCE's Rob Beeren. Learn more about the DCE Championships webcast. Learn more about the DCE Championships.